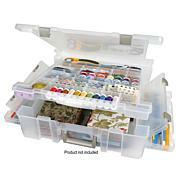 ART BIN-Super Satchel Box with 2 Removable Thread Trays securely holds thread spools regardless of how the closed box is stored. 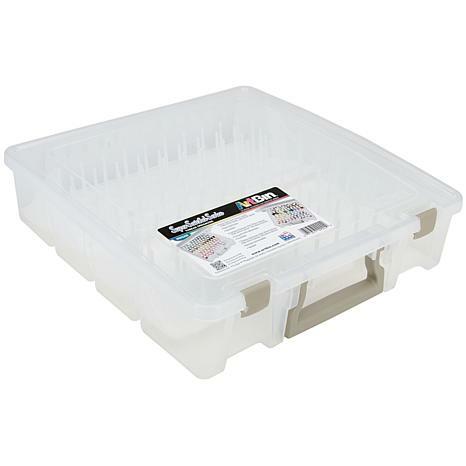 Spool trays offer the capacity to hold (224) 20mm spools, (108) 32mm spools, or (30) 45mm spools. Designed to easily stack and work together. Molded in translucent Acid Free polypropylene. Measures: 3.5Hx14Wx15D. (accessories not included). I purchased this for my sewing room. Keeps my thread organized. Love it . I was really surprised when I received this in the mail. First of all it arrived VERY quickly in the middle of all the holiday crush! It was much nicer and larger then expected. It is purchased as a gift. I am very anxious to see HIS reaction I know he will love it. 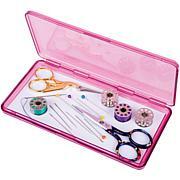 If you like organizing your sewing threads you NEED this. I am going to buy myself 1. I HAVE TO HAVE ONE NOW!! The best quality thread storage solution I have ever used! Holds more than you can imagine! 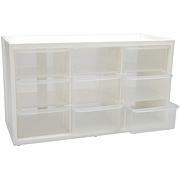 I will definitely be buying more Art Bin storage products!Thank you, HSN! You're still here for the crafting world and we appreciate it! I just recently purchased a fancy embroidery/quilting/sewing machine and needed a convenient place to organize and store all my desk or at I've threads. This is the perfect size for the decorative spools and cones. 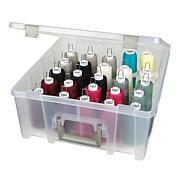 It holds a lot of decorative thread spool sizes perfectly and seems quite sturdy and well made. Hold lots of small spools, however the spindles are too close together to put the larger spools next to each other.